Shhh! was directed by Upendra and starred Kumar Govind, Kashinath, Sadhu Kokila and Bank Janardhan. Film tells the story of film crew who visit a coffee estate for shooting. There they start facing many mysterious problems caused by an unknown power which everyone thinks is done by a ghost. Hero and director try to find the reason behind it. 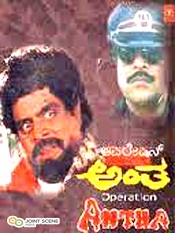 Operation Antha was directed by Upendra and starred Ambareesh, Tara, Dr.Ramesh Kamath and Sadhu Kokila. Film tells the story of gangster replaced by a police officer to find out the real criminals. “A” was directed by Upendra and co-starred Chandini, Archana and Marina. Film was made with budget of INR13 million and earned INR200 million at box office. Film tells the story of young film director who falls in love with his heroine. But she starts to neglect him and he realizes that she is running behind money and fame. Film is considered as a first directional deviation in narration in Kannada Industry. Kanyadanam was directed by E. V. V. Satyanarayana and co-starred Srikanth, Rachana and Brahmanandam. Film tells the story of young bachelors who come to city finding jobs. Hero falls in love with the girl but she was married to another man who happens to be hero’s friend. After marriage he comes to know that she is in love with his friend and decides to take her back to him. 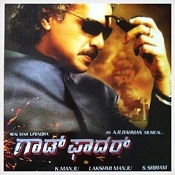 Upendra was directed by Upendra and co-starred Raveena Tandon, Prema and Damini. Movie was a huge blockbuster hit and celebrated 200 days run in Karnataka. Film tells the story of man loving three different women at the same time. He believes that a person can love many people at the same time. Preethse was directed by D Rajendra Babu and co-starred Shivrajkumar and Sonali Bendre. Film was a huge commercial hit and celebrated 25 weeks in Karnataka. Film tells the story of young man madly falling in love with a girl and decides to do any psychopathic deeds for her. When her marriage is fixed with another man he decides to kill him by hook or crook. Raa was directed by KS Nageswara Rao and co-starred Priyanka Upendra, Dhamini, Sadhu Kokila and Giri Babu. Movie was a commercial hit and earned INR6 crores at box office. Film celebrated 100 days of run in Andhra Pradesh. H2O was directed by N Lokanath and co-starred Prabhudeva, Priyanka Upendra and Sadhu Kokila. Film was a hit and celebrated 50 days of run in 28 centres of Karnataka. Film tells the story of young man falling in love with a girl belonging to other village. Story has resemblance to Kavery dispute between Karnataka and Tamil Nadu. Rest of story is how he gives a solution through the example of Conjoined twins which can’t be separated. Nagarahavu was directed by S Murali Mohan and co-starred Jyothika, Sadhu Kokila and Doddanna. Film is a remake of Bollywood blockbuster Baazigar. Film tells the story of young man taking revenge for the injustice done to his parents. Hero doesn’t disclose his identity and falls in love with daughter of antagonist who destroyed his family. He kills his first daughter and falls in love with second daughter. Later takes control of all his property through general power of attorney. Kutumba was directed by Naganna and co-starred Natanya Singh, Ashok, Gurukiran and B.C. Patil. It was remake of Telugu super hit Gang Leader starring Chiranjeevi. Film tells the story of youngest son of joint family who is a carefree person. His elder brother sacrifices everything to see that his brother completes IAS exam. He was murdered by antagonist but his brother marries his daughter without knowing the fact. Rest of story is how youngest son takes revenge. Raktha Kanneeru was directed by Sadhu Kokila and co-starred Ramya Krishna, Sadhu Kokila, Abhirami and Kumar Bangarappa. Film turned out to be the biggest hit of the year. Film tells the story of arrogant NRI coming back to India and getting married to a girl from well cultured family. But he falls in love with a prostitute who uses him for money and robs him of all wealth. He becomes a beggar and at that stage his wife feeds him without knowing his true identity. Gokarna was directed by Naganna and co-starred Rakshita, Madhu Bangarappa, Tennis Krishna and S.Ramesh. Film was remake of Tamil blockbuster hit Annamalai starring Rajinikanth. Film tells the story of young man who was insulted by the father of his best friend. He challenges his best friend that he would earn more money than him and teach him a lesson. Rest of story is how this milk selling man reaches to the top of business. Film celebrated 175 days run in Karnataka. Gowramma was directed by Naganna and co-starred Ramya, Srinivasa Murthy, Doddanna, Ramesh Bhat, Komal and Sadhu Kokila. Film was remake of Telugu super hit Nuvvu Naaku Nachav starring Venkatesh and Arti Agarwal. In kannada also it was a huge commercial hit and celebrated 100 days run in Karnataka. Film tells the story of young man entering into the house of his father’s best friend. He goes there to help the engagement function of his daughter. But while doing the preparations, shopping etc he falls in love with his daughter but doesn’t want to disturb their family and decides to sacrifice his love. Auto Shankar was directed by D. Rajendra Babu and co-starred Shilpa Shetty and Radhika. Film tells the story of young auto driver fighting against the lady don and her daughter. Lady is a money lender and adapts any methods to recover her money, once hero fights with her daughter and they fall in love subsequently. Later it was revealed that she is not her daughter. Aishwarya was directed by Indrajit Lankesh and co-starred Deepika Padukone, Daisy Bopanna and Kishan Shrikanth. Film was made with budget of INR30 million and earned INR50 million at box office. Hero falls in love with a model who starts to use him for getting good offers. But when she dies in an accident he was told that she is married to another person. From that day he starts hating all women and advises all men not to trust girls. Rest is how he realizes his mistake and falls in love again. Budhivanta was directed by Ramnath Rigvedhi and co-starred Pooja Gandhi, Natanya Singh, Brindha Parekh, Suman Ranganath and Saloni Aswani. Film was made with budget of INR40 million and earned INR150 million at box office. Film tells the story of young man marrying four different women with different identities. All of them are cheated in strange ways and when he is arrested for cheating he claims that he isn’t the one who cheated him, he claims that may be it was done by someone who looks exactly like him. Movie celebrated 100 days screening run in 25 centres of Karnataka. Super was directed by Upendra and co-starred Nayantara, Sadhu Kokila and Tulip Joshi. Film was made with budget of INR120 million and earned INR350 million at box office. Film tells the story of young man coming from abroad and decides to rule the underworld in India. He starts to use the system weakness against it and climbs the ladder fast. In the end he becomes very rich and becomes a politician. He makes India a richest country in world. Katari Veera Surasundarangi was directed by Suresh Krishna and co-starred Ramya, Ambarish and Doddanna. Film was made with budget of INR80 million and earned INR160 million at box office. Film was sequel to Blockbuster hit Rakta Kanneeru. In hell beggar hero meets his look alike gangster son killed in mafia. Gangster falls in love with Lord Indra’s daughter Indraja and rest is how he faces all gods. Godfather was directed by Sethu Sriram and co-starred Soundarya Jayamala, Catherine Tresa and Bhumika Chawla. Film was made with budget of INR4.5 crores and earned INR8 crores at box office. Film tells the story of father and sons raised in different ways, one is raised by his father and the other is raised by his mother. In flashback it was shown that the father was a dancer and when he was insulted by heroine he rapes her and as a result she gives birth to twins. Kalpana was directed by Rama Narayanan and co-starred Lakshmi Rai, Saikumar and Babu Antony. Film was made with budget of INR4 Crore and earned INR11 Crore at box office. It is a remake of Tamil super hit Kanchana released in 2011. Film tells the story of young man possessed by a unrest soul. The ghost uses him to take revenge against the people who did injustice to his family. Topiwala was directed by MG Srinivas and co-starred Bhavana and Raju Talikote. Film was made with budget of INR65 million and earned INR97 million at box office. Movie was a commercial hit.